Every four years, the Federation of European Nutrition Societies (FENS) organizes a European Nutrition Conference. In 2015, the twelfth year of the conference, the event took place in Berlin, Germany from October 20th to 23rd. In total, about 1,700 researchers and representatives from industry, government and health media were present from multiple countries. The main objective of this conference was to combine efforts toward the development of research and education in nutrition sciences and to promote the importance of nutrition for public health in Europe. 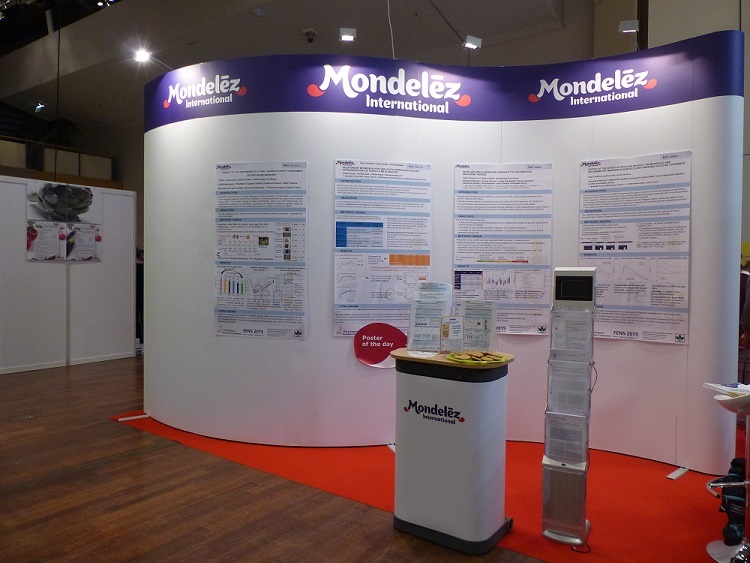 We welcomed attendees on Mondelēz International stand and discussed the latest scientific insights, namely slowly digestible starch, wholegrain and satiety. The conference was also the opportunity to introduce our Call For Well-being which focuses on four areas where we believe we can make the greatest difference: mindful snacking, sustainability, safety and community. In each of these areas, we outlined specific goals to which we hold ourselves accountable. We continue to make progress toward our goals and to scale our efforts with our partners and suppliers to achieve our commitments to making impactful change. We have conducted over twenty years of research into carbohydrate quality and more specifically into starch digestibility in cereal foods and its impact on postprandial metabolic responses. 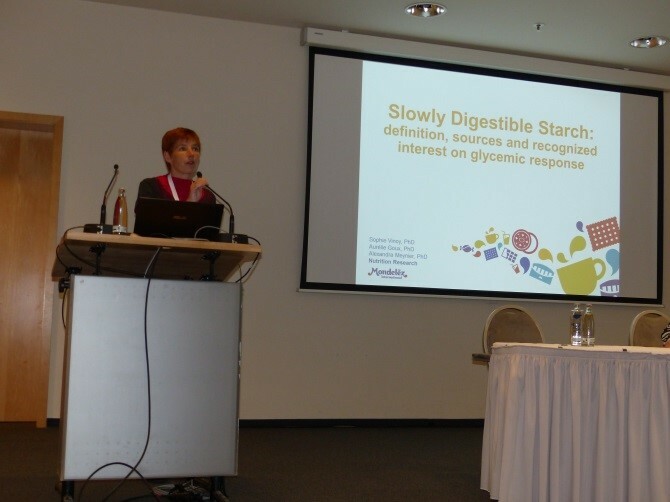 In order to provide the most recent state of the art on slowly digestible starch and its health interest, we organized a symposium entitled "Slow-release carbohydrates – Growing evidence on metabolic responses and public health interest". The forum session was coordinated by Prof. Martine Laville from Lyon University, France. Detailed proceedings and a conference summary report will be published during the first half of 2016. They will be available on this website. We co-organized the HEALTHGRAIN FORUM symposium titled "Cereal foods and health – new results and science based nutrition guidelines". The symposium chair was Prof. Gabriele Riccardi, Federico II University, Naples, Italy. This symposium is in line with our public commitment to increase whole grains by an average of 25 percent across our global portfolio by 2020 (from a 2012 baseline). Presentations are available here. The report of the HEALTHGRAIN Forum Session – authored by Margaret Ashwell and Jan Willem van der Kamp – has now been published in Complete Nutrition Vol. 16 No. 1 (Feb/Mar 2016), p86-89. - Lesdéma A, Piquenot E, Marcuz MC, Vinoy S. 2015. Validity of the performance of a panel trained in satiety assessment on food intake measures. View/download poster. - Meynier A, Lambert-Porcheron S, Roth H, Normand S, Laville M, Vinoy S. 2015. Effect of the intake of high-SDS product on metabolic and inflammatory markers in subjects with impaired glucose tolerance. View/download poster. - Meynier A, Wolever T, Brand-Miller J, Cazaubiel M, Jenkins A, Atkinson F, Gendre D, Vinoy S. 2015. Inter- and intra-laboratory variability of glycemic and insulinemic indexes. View/download poster. - Vinoy S, Goux A, Brack O, Meynier A. 2015. Relationship between in vitro and in vivo approaches on slow appearance rate of starch: a meta-analysis. View/download poster.